A reader asked me about hygiene’s role in Chado. 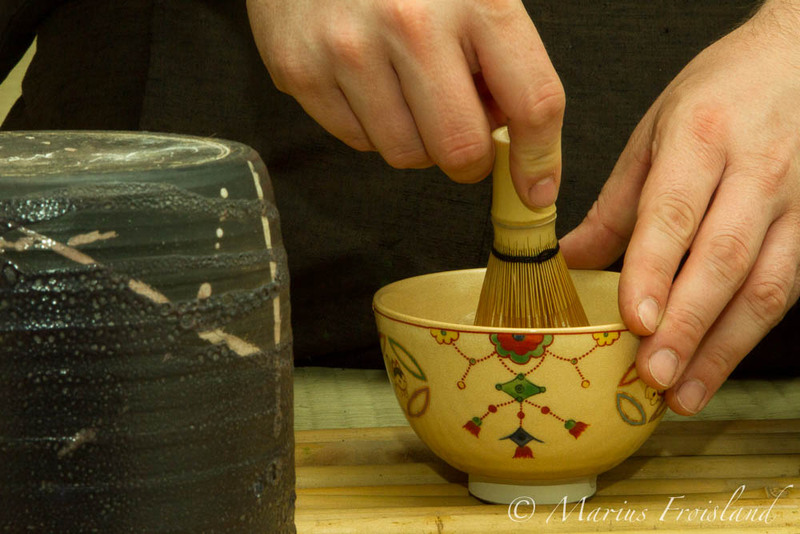 As you can imagine, Tea ceremony is an old art with roots back to a time when hygiene was viewed very differently. In the 16th century, Queen Elizabeth supposedly said “I have a bath once a year, whether I need it or not.” Still, purity and immaculateness are important aspects of Tea traditions. Cleanliness habits vary from keiko-ba to keiko-ba. I have attended keiko in places where everything is newly washed, but I have also visited places where the chasen are filled with dark spots of leftover tea from a bygone era. For special events, even the cleanest keiko-ba is deep cleaned. A lot of extra effort is put into the cleanliness at such a day. However, I believe my reader was wondering more day-to-day hygiene, and how things are handled for keiko. I always start every Tea session by washing my hands. Nowadays, we realize that this is important for hygiene reasons. Traditionally, the guest performed a ritual purification of the hands using cold water same way as when entering a temple. From my point of view, there are two main groups of utensils for the purpose of cleaning. It is the ones used for drinking tea and the once used for eating. Most utensils are rinsed out and wiped dry with a fukin. I use cold water, and this has also been the practice in most mizuya I have visited. If I had hot water available in the mizuya, I would have preferred it to the cold water. 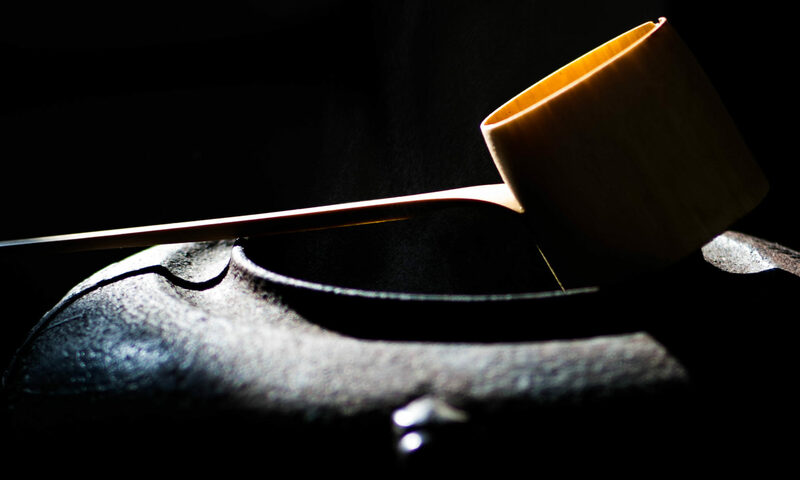 I have never used soap on any of my utensils for drinking tea – it has actually never even crossed my mind. The item that takes me the longest to clean, is the chasen. First, I rinse it out in a chawan by wisking hard. Next, I use my fingers to remove any spots of the left on the chase and rinse it in cold water once more. Chashaku, chaire and natsume are cleaned using only a paper tissue, removing leftover matcha. After an event, I bring all the eating utensils up to my regular kitchen, where they are cleaned using hot water, soap and a brush, like any other eating utensils. I wish I could run them in the dishwasher, but unfortunately, I don’t have much hope that they could survive. After using a zokin to clean the tatami, I find a clean one to keep in the mizuya for cleaning out kensui or wiping up spots. Here, I believe that I’m more “aggressive” in my cleaning than most. Most other places I have visited, only rinses their zokin out in water and hang them to dry. I reuse my Fukins until either there is visible tea spots on them or they are too wet. Then, I run both fukin and zokin in the washing machine. At my place, chakins are used over and over. I try to clean them out as best I can in the chakin-darai using cold water and an amble amount of rubbing. If I am unable to remove the tea stains, I bring out the bleach and let them soak in it for a while before I rinse them out. I have noticed that other places do this differently. They will remove them from the mizuya after a single keiko, wash them (usually by hand) and even iron them before they are returned. Putting the chakin in the washer is not recommended, as the seams tend to come loose. Whenever I have an event, I bring out a new chasen and chakin for that event. That also gives me the perfect opportunity to get rid of some of my older ones. It is common to swipe the tatami or zokin them before or after every practice. Failing to do so will be very obvious as everybody uses white socks in the Tea room. Usually when I do Tea in the morning I’m all alone. 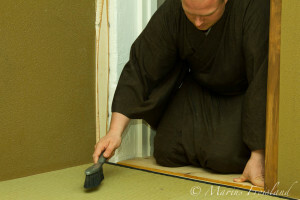 There is a limit to how much dust and dirt one person drags into the tea room, and so I usually only clean the tatami once a week or before I have students joining me. I figure it is almost the same as before every practice in a group with 5-6 people. In my mizuya there is no running water, and no proper sink. I keep my cold water in a ceramic bowl with a wooden lid. It is not emptied after every session, instead I leave the water in there from one day to another. Whenever I do empty it, I rinse it and wipe it with fukin. All other places I have been to have either not had a proper mizuya, using a western kitchen instead, or have had the convenience of running water. I have a fake sink in my mizuya. 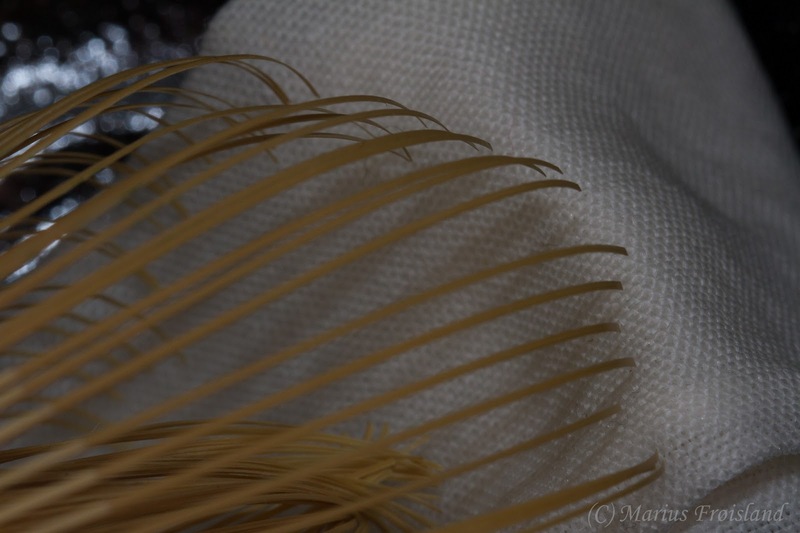 It is a big flat bucket covered by a coarse bamboo cover. Kensui, chakindarai and such are just left on top of the bamboo cover to let the water run of them. This is probably the item that I’m least good at cleaning. Other places I have studied with a similar setup, would clean and dry of this after every session. Since my sink is just a big bucket it needs to be emptied. It is a bit of a job to do that at my place, so I try to postpone it as long as possible. In the beginning, I noticed an odor of algae emanating from it after a while. I guess all the tea is providing nutrient for fermentation or some similar process. To avoid this, I dump a decent amount of bleach, which also has disinfectant properties, into the bucket after cleaning it. That way there seems to be no fermentation. I haven’t been to any other places that have a fake sink. They either have a proper mizuya or a western kitchen. 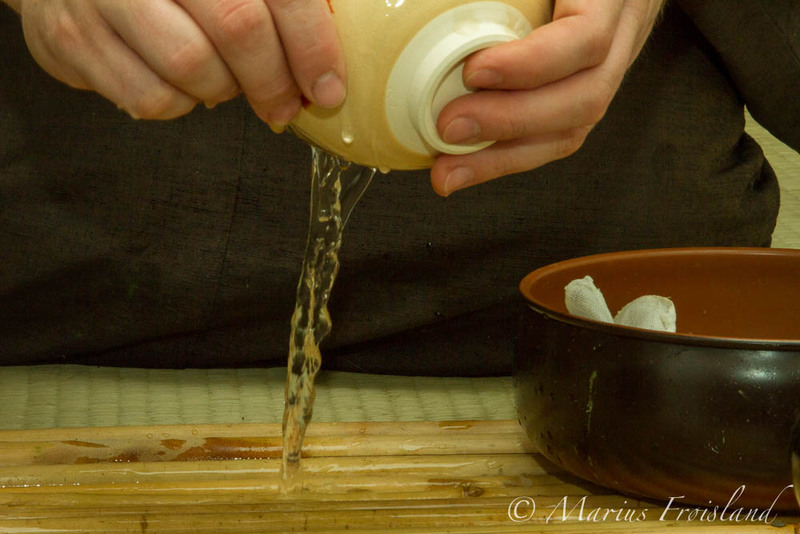 I hope this little run-through has been helpful for those of you who wonder about hygiene in Tea ceremony. It is now possible to get a e-mail notification when a new article is posted on this blog. Just enter your e-mail into the subscription box on the right hand side of the blog.